Need to relax or take a break? You’re going to love this! Well, especially if you’re a human. Speaking about Catster again, I joined several cool groups. One of them is BOCU: Brilliant Orange Cats Unite! “If it ain’t orange, it just ain’t happening.” Are you an orangie who rules the home? BOCU is a meeting place for those royal felines who are orange & white. Catster: I’m Cat of the Day! 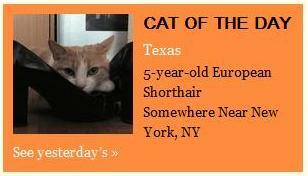 I’m Cat of the Day! Yippee!! 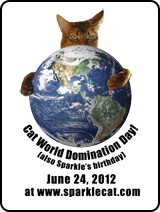 Thank you to the Catster Community! Just found this cool website. Check it out: Catster.